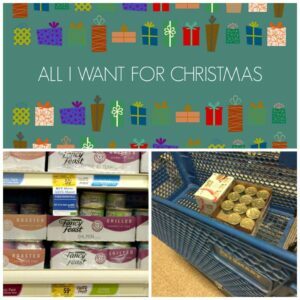 This post is sponsored by PetSmart® and the BlogPaws Pet Influencer Network. I am being compensated for helping spread the word about New Low Prices on Friskies and Fancy Feast at PetSmart, but More With Less Today only shares information we feel is relevant to our readers. PetSmart is not responsible for the content of this article. While out shopping for all your family members this busy holiday season, don’t forget about your furry family members too! It will be worth your while to make a stop at PetSmart®. 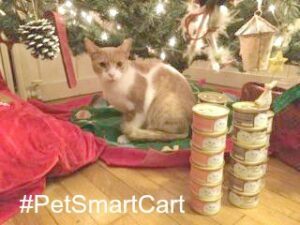 It is Stock Up and Save for the Holidays at PetSmart when you buy 24 cans or more of Fancy Feast cat food. The entire of stock of Friskies is a special value now with the exception of Fancy Feast Medleys. You see new low prices when you buy 24+ cans versus the single can price, plus the PetSmart prices are already good. 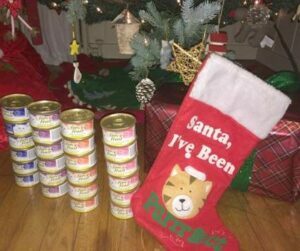 During the busy holiday season, you’ll have plenty of kitty’s favorite food so you won’t have to run out and you’ll save money too. I had gotten in the habit of buying pet food a week at a time but now I do stock up and save whenever I see low prices. Not only does it save money, it saves time too with no more last minute trips to buy pet food. I don’t have to tell you that cats can be finicky, fussy creatures who often refuse to eat when the food is not to their liking. Our kitty has always loved Fancy Feast. I often mix it with her dry food but she prefers it straight from the can and starts bumping my leg and purring whenever she sees those cans. I’ve tried many of the Fancy Feast flavors and have yet to find one she doesn’t like. You can either mix and match to create your own value pack or save when you buy a pre-selected value pack. PetSmart has pet gifts too like sweaters and toys. The new lower price for Fancy Feast and Friskies is available now at PetSmart. Find the closest store and stock up! Did You Know? 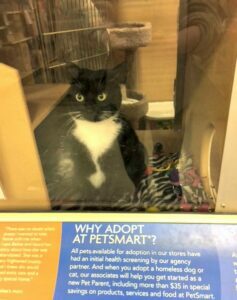 You can adopt a fur-ever friend at PetSmart. While I was shopping, this sweet face was watching me.